Our second POLR Presents night and we mean to carry on as we began, with fantastic folk music in the infamous Harrison basement. The new young blood of the London Folk scene, The Medlars are a seven piece psychedelic folk rock band with ‘acid-sharp observational lyrics’ FolkWords. They formed in early 2016 through Jimmy Grayburn, who at the time was performing as a solo artist. 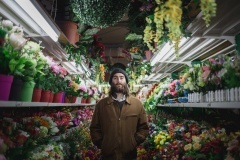 His lyrics tackle issues around environmentalism, homelessness and austerity cuts and are accompanied by the Medlars’ unique and frank sound. Their debut album was released in May 2015. Born and raised in Bristol, Jamie Cruickshank is a musician and songwriter. From fuzz guitars to the banjo and mandolin, his music is an experimentation on strings, heavily influenced by folk music from the British Isles and Appalachia. Jamie Cruickshank’s lyrics delve into family, change and mathematics, tied to the landscapes of home, mountain, sea and city. His debut single I Can See Totterdown is out in October.